Home > Blog / News > What Is The Impact of Screen Time? – 50% of young people think they are addicted to their devices. – 57% of adults feel that their teens spend too much time connected to their screens. – And 1/3 of families argue daily about screen time. But even if not, ‘Screenagers’ will inform you about the impact of screen time on the development of your teenagers, both socially and cognitively. Physician and filmmaker Delaney Ruston sought answers to the following questions after she experienced difficulty of policing screen time with her kids:What does screen time look like for kids at the moment?Why are they becoming so addicted? 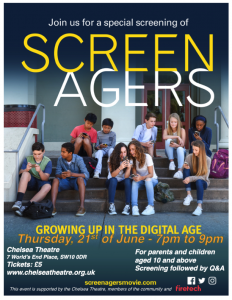 Fire Tech is proud to be sponsoring the showing of ‘Screenagers’ at Chelsea Theatre on 21 June at 7pm. 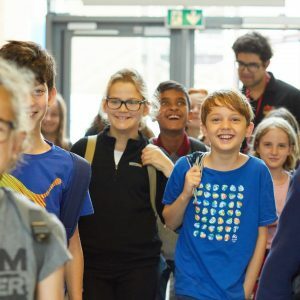 Fire Tech’s founder and CEO, Jill Hodges, will take part in a panel discussion to discuss these topics and explain how Fire Tech is helping young people have an empowering relationship with technology. To buy tickets, follow this link.